149 players. In the final of the open event, Kaden Xu (USATT-rated 2713) beat the WTTC's Kai Zhang (2654) (2,6,5). Results and winners' photos. Video of semifinal Xu vs. Jian Li • Zhang vs. Jun Long Qin • Final Xu vs. Zhang. • Action shots from Glen Randmer • Ashoke Tewari Day 1, Day 2 • Jay Chelur • Rich London. 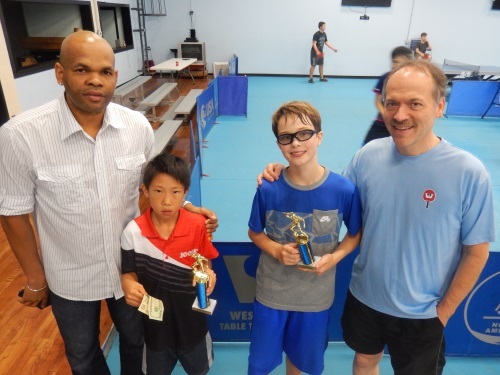 The NCTTA Northeast Regional Championships were held at the WTTC on March 9-10. More than a dozen schools took part in singles and team competition. Results • Report with photos in MetroSports Magazine • Action shots from Glen Randmer • Warren Rosenberg • Nancy Zhou. 167 players in an extraordinarily strong field — 15 rated over 2500. In an all-foreign final, Austria's Robert Gardos (ranked #52 by the ITTF) beat Korea's Tae Hoon Kim (USATT-rated 2666) (9,6,6). In the semifinals, Gardos beat Kai Zhang (2654) in five games; Kim beat Kaden Xu (2722) in four. Results and winners' photos. Video of the final • Gardos/Zhang semifinal • Kim/Xu semifinal • Audio interview (4:07) with Gardos. • Program • Action shots from Rich London • Jay Chelur Day 1, Day 2 • Glen Randmer. More than 30 players 12 and under took part in the USATT Hopes Training Camp and Tournament on Feb. 8-10, under the direction of national coach Pieke Franssen, Judy Hugh, and the WTTC's Rawle Alleyne and Kokou Fanny. In the final of the Boys event, the MDTTC's Stanley Hsu (USATT-rated 2144) defeated Aryan Jha (1926) (4,8,6). In the Girls event, the best records were compiled by Ava Sun (1848) and Amoolya Menon (1325). Photos from Warren Rosenberg • Glen Randmer • Jay Chelur. 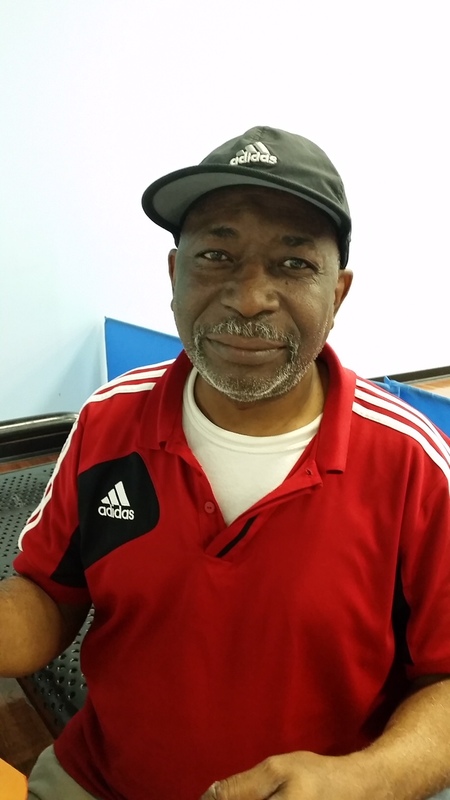 Missing our dear friend and table tennis companion, Lloyd (Benji) Benjamin. 180 players, including nine rated over 2500. In the final, Kaden Xu (USATT-rated 2696) upset the reigning U.S. Open champion Eugene Wang (2806) (9,5,6). Results and winners' photos • Videos of the Xu/Hazin semifinal • Wang/Alguetti semifinal • Wang/Xu final • Audio interview with Kaden (3:22) • Another (1:06) • Program • Action shots from Jay Chelur • Glen Randmer • Rich London. 186 players, one less than the record. Players came from Finland, Germany, Spain, South Africa, Guyana, Hong Kong, Canada, and coast to coast in the U.S. In the final, Kaden Xu (USATT-rated 2691) defeated Zhiwen He (2671) (14,10,-11,7). Results and winners' photos. Video of the final. • Action shots from Glen Randmer • Rich London. 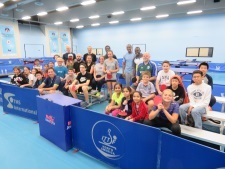 Almost 70 players -- young and old, of all skill levels -- took part in the WTTC's annual Holiday Camp Dec. 27-28. 142 players, including a nine-member team from South Korea. In an all-Westchester final, Kai Zhang (USATT-rated 2633) defeated Sharon Alguetti (2590) (7,-6,7,9). Results and winners' photos. Video of the final. • Ben Nisbet's interview with Kai (2:55) • Photos by Jay Chelur • Glen Randmer • Henry Lee • Rich London. 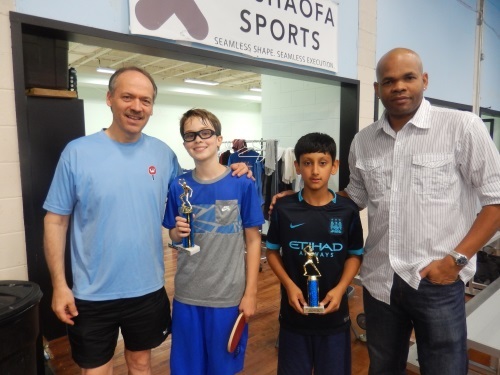 El-Sayed Lashin, former #76 in the world, and Ibrahim Hamato, who learned to play table tennis without his arms after a train accident at age 10, visited the club on Oct. 21 and played exhbiition matches. • MetroSports report and photos • Photos by Jay Chelur. 139 players. In the final, Jishan Liang (USATT-rated 2626) beat Kai Zhang (2642) (13,9,-4,-7,4). Results and winners' photos. Video of the final. Interview with Jishan (:50). Action pics from Warren Rosenberg • Jay Chelur • Glen Randmer. 179 players, including 10 rated over 2500. In the final, the WTTC's Sharon Alguetti (2681) beat Japan's Akifumi Hamakawa (2683) (11,-7,10,-8,9). Results and winners' photos. • Video of the final. • Game 5 of the final only (edited) • Interview with Sharon Alguetti (1:23) • Tournament program. • USATT report • Glen Randmer's action shots. 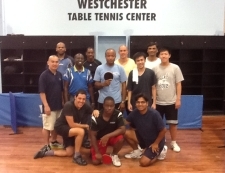 The ITTF has selected the Westchester TTC to host the 1st International Parkinson's Table Tennis Tournament in 2019. Date tbd. Thanks to Nenad Bach for pioneering this effort. 187 players, a new WTTC record. In the final, the WTTC's Sharon Alguetti (rated 2648) beat Jishan Liang (also 2648) (-6,7,7,9). First prize was newly raised to $2,000. Taipei's De-Yang Chih won U2500; Slovakia's Peter Turcek won U2350, Ghana's Courage Nanevie won U2200, and Jamaica's Curtis Dehaney was on a winning doubles team. Results and winners' photos. • Video of the final. • Semifinal #1 Sharon vs. Akifumi Hamakawa • Semifinal #2 Jishan vs. Gal Alguetti • Ben Nisbet's interview with Sharon (1:54). • USATT article. • Sunday action shots from Glen Randmer. Co-founder of the Rivertowns Table Tennis Club, the predecessor of the Westchester TTC, Stefan Kanfer was a longtime writer/editor for Time magazine and the author of best-selling biographies of Marlon Brando, Lucille Ball, Groucho Marx, and other celebrities. A wit, a raconteur, a good friend, and member #1 of the Westchester TTC. We miss him. 138 players, including 12 rated over 2500. In the final, Poland's Lucjan Blaszczyk (2758; former ITTF top 20 in the world) defeated Jishan Liang (2634) (7,5,-5,11). In a semifinal match, chopper/smasher Jian Li (2640) forced Lucjan to five games. Results and winners' photos. Video of the final • Blaszczyk/Li semfinal. Action shots from Jay Chelur • Henry Lee • Joel Hoffman • Glen Randmer. A record 174 players, including four rated over 2600. In the final, Kaden Xu (2686) defeated Jishan Liang (2650) (7,5,6). The most spectacular match was the five-game semifinal Xu vs. Jian Li. Results and winners' photos. Video of the final • semifinal #1 (Xu vs. Jian Li). Jay Chelur's photos Day 1 • Day 2. Glen Randmer's Day 2 photos. Congratulations to Ray Herbst — champion of the WTTC's Spring 2018 League Night series. He was part of a winning team 13 of the 20 weeks and took home $100. Miguel Ballesteros was second (12 weeks) and won $50. Summer League Night begins May 31. 140 players. In the final, Marco Navas (2478) of the Venezuelan table tennis team fell to Sharon Alguetti (2639), defaulting while down 4-0 in the fourth game. In the semis, Marco beat Jian Li (2638) (-11,10,10,7), and Sharon beat Kai Zhang (2646) (11,7,11). Results and winners' photos. Video of the final. Glen Randmer's photos • Jay Chelur's photos Day 1 • Day 2. 147 players. In the final, Jian Li (2624) defaulted to Kai Zhang (2610) with a leg cramp, after being down (-10,10,4, and 4-2 in fourth). Results and winners' photos. Action shots from Jay Chelur (Day 1, Day 2), Glen Randmer. Video of the final. Twelve schools — Brandeis, Brooklyn, Brown, Columbia, FIT, MIT, Northeastern, NYU, Rutgers, SUNY Stonybrook, Tufts, and Yale — competed in the Northeast NCTTA Championship on March 10-11. As a team, NYU took first place. NYU's Adar Alguetti won men's singles. Erica Wu won women's singles. Photos from Glen Randmer. MetroSports Magazine writeup. 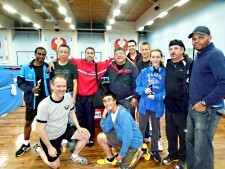 On Sunday, March 4, eight members of the Madison (NJ) 'Y' TTC came to Westchester for a friendly interclub competition. All players were rated 1700-2050. Each player played everyone on the opposing team -- 64 matches in all. Westchester won 33-31. Pizza, snacks, and soft drinks were served. Photos and More photos by Joe Wu. 169 players, including 10 rated over 2500. In the final, Junhan Wu (2698) defeated Jian Li (2614) (2,5,6). 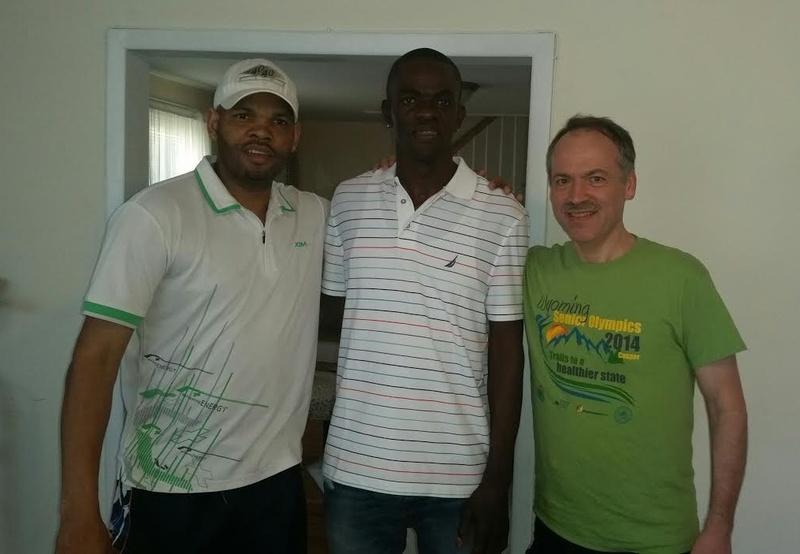 Nigeria's Hammed Adeyinka (world-ranked #577 by the ITTF) reached the quarterfinals. Results and winners' photos. Sunday action shots from Warren Rosenberg, Glen Randmer. Video of the final. 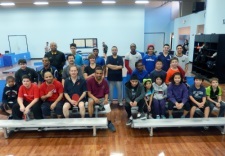 The world's first Parkinson's Table Tennis Championship was held at the club on Saturday, Feb. 17. The players included one from Denmark and six from the WTTC. Photo-essay by Bruce Ballard. Glen Randmer's photos. Channel 12 news piece (:53). 163 players. In the final, the WTTC's Sharon Alguetti (2615) defeated China's Nuo Xu (2533) (-8,4,10,3). Sharon is only the second U.S.-trained player to win the tournament, and Nuo is only the third female player to reach the final. Results and winners' photos. Glen Randmer's action shots. Video of the final. More publicity for the WTTC's Ping Pong for Parkinson's program ran on the Mandarin channel of Voice of America (3 minutes 26 seconds). Video. 152 players, including 10 rated over 2500. In the final, Croatia's Tomislav Pucar (2820; world-ranked #84 by the ITTF) defeated the WTTC's Kai Zhang (2606) (7,9,4). The tournament's highlight was Pucar's narrow semifinal win over chopper/smasher Jian Li (6,8,-5,-10,5). Results and winners' photos. Video of the final. Action shots from Jay Chelur (day 1) (day 2), Glen Randmer. 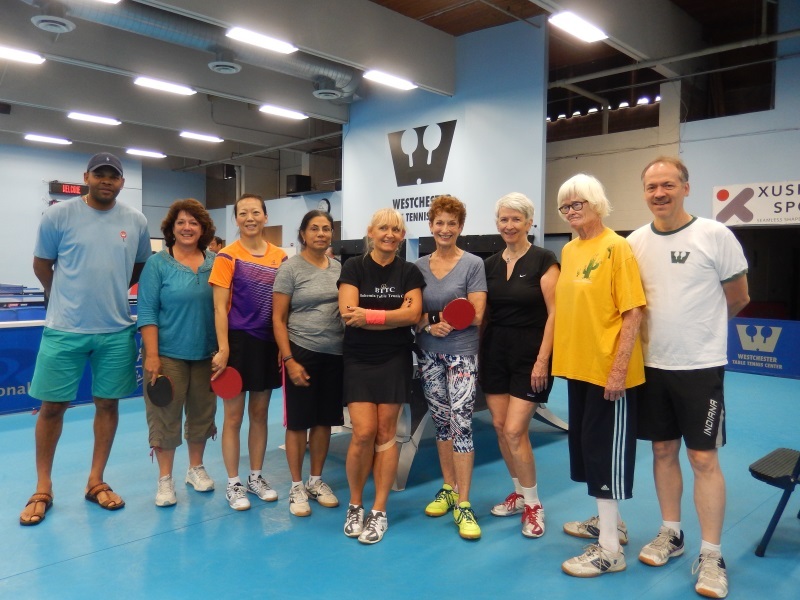 The WTTC's innovative Ping Pong for Parkinson's program was featured on the CBS Evening News on Dec. 30. Video. Around 20 people attended a party for the launch of Rob Bernstein's new book, "Uniquely Normal." Rob discussed several of the book's 27 case studies on treating autism. 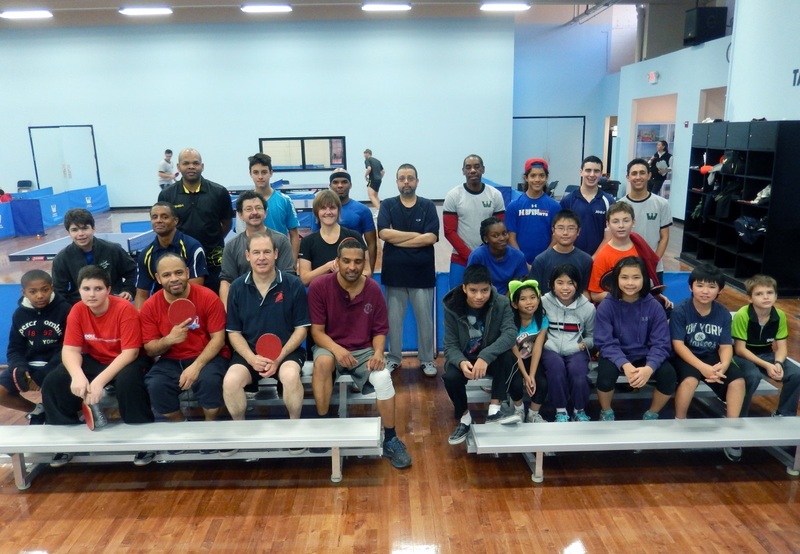 Fifty players from as far away as Seattle, Austin, San Antonio, and Minneapolis took part in the championship of the National Over-40 Table Tennis Tour on Dec. 2-3. In the final, New York's Yanjun Gao (2619) beat Yu Shao (2528) (11,7,-8,8,12) to take home $3,000. Four-time U.S. men's singles champion Jimmy Butler finished third. Almost $12,000 was awarded altogether. The event was the culmination of 14 over-40 tournaments (the "Tour") held across the U.S. in 2016-17, as a prelude to the World Veterans Championship coming to Las Vegas in June 2018. Results and winners' photos. MetroSports magazine writeup. Action shots from Warren Rosenberg, Jay Chelur, Glen Randmer. 137 players, including visitors from Indonesia, New Zealand, the U.K., Nigeria, Canada, and China. Five players were rated over 2600. In the final, China's Wei Wang (2754) defeated Jian Li (2671) (5,5,-12,9). Results and winners' photos. Action shots from Jay Chelur, Glen Randmer, TJ Braley. Video of the final. 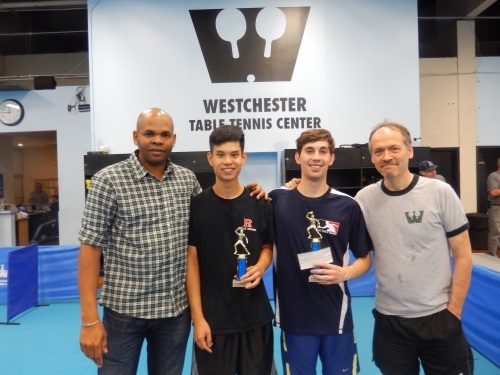 More than 60 athletes from eight NYC-area colleges competed at the Westchester TTC on Saturday, Nov. 4, for their NCTTA divisional championship. The top finishers were NYU and Yale. Warren Rosenberg's photos and wrapup. 132 players, including seven rated over 2600. In the final, Jian Li (2682) beat Canada's Jeremy Hazin (2531) (8,7,7). Results and winners' photos. Glen Randmer's action shots. Video of the final. On October 3 Will celebrated five years -- 1,826 days -- of playing table tennis every day. More than 75 players attended. Will played (and filmed) nearly every one of them for a YouTube video. Jayadas Chelur's photos. 158 players, including six rated over 2600. In the final, Slovenia's Bojan Tokic, world-ranked #62 by the ITTF, beat Jishan Liang (2686) (3,-5,4,1). In the final of Puzzle Pong, in which players answered brainteasers and trivia questions for points while playing, Rahul Acharya beat brother Rohan 21-19. Results and winners' photos. Sunday action and personality shots from Glen Randmer • Jayadas Chelur • Henry Lee • Joel Hoffman. Video of the finals. 65 players from as far away as Ecuador, Alaska, and Montreal. In the final of the open event, Yanjun Gao (2632) defeated Yu Shao (2530) (3,7,8). Former World Veterans champion Yuxiang Li swept three age events — 50+, 55+, and 60+ — without losing a game. Results and winners' photos. Glen Randmer's action shots from 9/10. 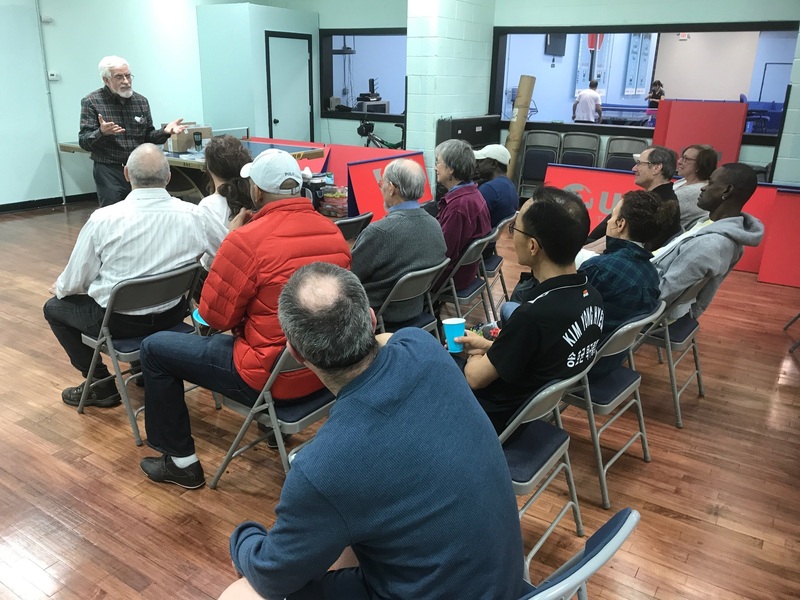 The Westchester TTC celebrated six months of its Parkinson's Night program, for players diagnosed with Parkinson's, on Wednesday, Sept. 6, with speeches, refreshments, a song by Nenad Bach, and lots of play. Warren Rosenberg's photos and writeup in MetroSports Magazine. Over 100 people bid farewell to the college-bound Rahul Acharya and Amel Medunjanin. Adnan Medunjanin roasted a lamb, and the Acharyas provided Indian food. Photos from Glen Randmer. 134 players, including seven rated over 2600. In the final, Junhan Wu beat Jishan Liang (-2,8,-8,7,4). Results and winners' photos. Action shots from Glen Randmer. Semifinal #1: Wu vs. Yanjun Gao. Semifinal #2: Liang vs. Jian Li. Final: Wu vs. Liang. 157 players, including visitors from Canada, France, Spain, Pakistan, Trinidad and Tobago, Barbados, and Dominican Republic. In the final, Junhan Wu (2777) defeated Jian Li (2650) (8,-8,7,9). Table tennis legend Zhiwen He, four-time Olympian, 2016 world champion for 50+, once ranked 10th in the world, lost in a semifinal match to Wu. Results and winners' photos. Action shots from Warren Rosenberg, Glen Randmer, Joel Hoffman. MetroSports magazine writeup and photos. Video of the final. Semifinal video #1 He vs. Wu. Semifinal #2 Gao vs. Li. 140 players, including 12 rated over 2500. In the final, Junhan Wu (2754) defeated Kaden Xu (2690) (3,5,9). Nigeria's Kazeem Makanjuola, formerly world-ranked #346, lost in a quarterfinal match to Kaden. In the final of Puzzle Pong, an experimental event in which players answered word, logic, and trivia teasers while playing, Tom Lackaff (1606) defeated Rahul Acharya (2365) 21-18. Results and winners' photos. Glen Randmer's action shots. Video of the finals • Semifinal. 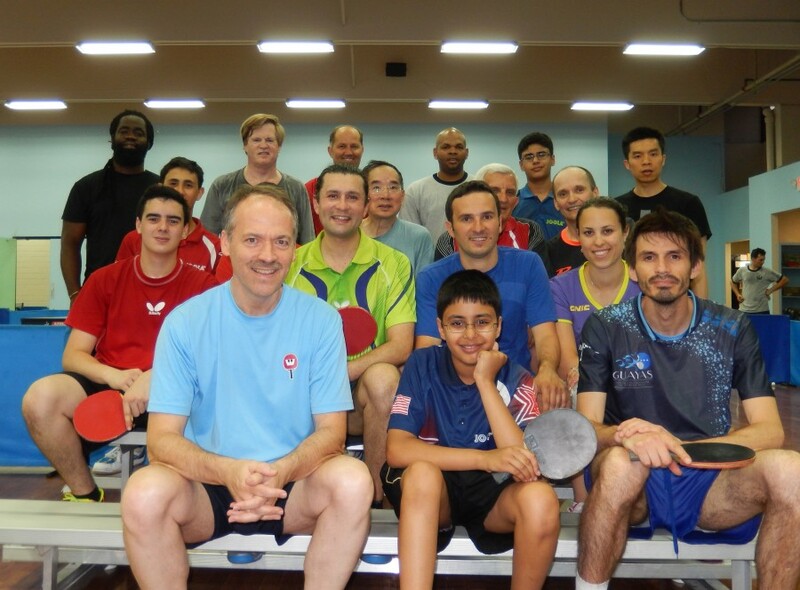 Seven-time table tennis Olympian Zoran Primorac, from Croatia, led two 90-minute training clinics at the club on Sunday, June 18. Altogether 37 players took part, with many additional guests for a party. Croatian rock star and club member Nenad Bach arranged the visit. Report by Leon Libin. Photos from Glen Randmer, Joel Hoffman. Video highlights. 127 players, including 10 rated over 2500. In an all-WTTC final, Kai Zhang (2641) defeated Sharon Alguetti (2621) (7,5,4). The real action was in the semfinals. In a stunning upset Sharon defeated China's Junhan Wu (2787) (-7,9,11,-4,9), and Kai edged past Sharon's brother Adar (2640) (15,14,-6,11). Results and winners' photos. Video of the final. Action shots from Joel Hoffman, Glen Randmer. 122 players. The open final featured two recent arrivals from China -- Junhan Wu defeating Deng Pan (-9,6,-8,8,9). Results and winners' photos. Writeup and photos from MetroSports magazine. Action shots from Warren Rosenberg, Glen Randmer, and Joel Hoffman. Video of the final. Semifinal between Nigeria's Azeez Jamiu and Junhan Wu. 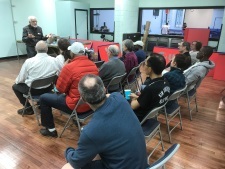 The Westchester TTC hosted the ping-pong play "ChipandGus," written and performed by John Ahlin and Christopher Patrick Mullen, on Friday, April 28, to rave reviews. 75 people attended. 115 players. In the open final, Jishan Liang (USATT-rated 2669) defeated Kaden Xu (2700). Results and winners' photos. Sunday action shots from Glen Randmer, Henry Lee. Video of the final. 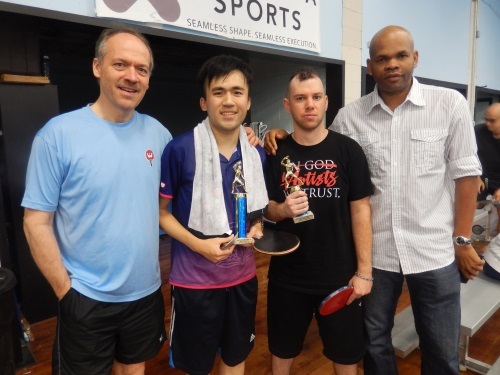 Congratulations to all the winners of the NE Championships of the National Collegiate Table Tennis Association, held at the WTTC on March 4-5. Schools competing were Baruch, Brown, Columbia, UConn, UMass, MIT, NJ Institute of Technology, NY Institute of Technology, NYU, Northeastern, Princeton, Rutgers, SUNY Stonybrook, Tufts, Worcester Polytechnic, and Yale. Results and winners' photos. Action shots from Glen Randmer, Ariel Chen. The Westchester TTC launched Parkinson's Night, for people with Parkinson's disease, on March 1. Channel 12 News covered it here. It continues every Wednesday at 7:30. The first night for anyone with Parkinson's is free. 153 players, including visitors from Russia, Nigeria, California, and Quebec. In the open final, Russia's Sergey Bratchenko defeated Zirui Zhao (2618) (-7,2,4,7). Results and winners' photos. Action shots by Henry Lee and Glen Randmer. Video of the final. A record 170 players, with 11 rated over 2500. In the open final, the WTTC's Kai Zhang (2659) overcame a severe leg cramp to defeat Sharon Alguetti (2631) (8,8,-11,9). In the semis, Sharon defeated the tournament's #1 seed, Jian Li (2661), and Kai sneaked past Nigeria's Azeez Jamiu (ITTF world-ranked #370). Results and winners' photos. Video of the final. Sunday action shots from Henry Lee, Glen Randmer. 116 players. In the open final, Junhan Wu, from China (2758), defeated the WTTC's Kai Zhang (2688) (2,-10,9,5). Results and winners' photos. Action shots from Glen Randmer. Video of the final. 117 players, including 14 rated over 2500. In the open final, Junhan Wu, newly arrived from China (estimated 2800), defeated Bohan Zhang (2728) (4,-9,6,8). In the semis, Bohan defeated Wei Wang (2815), and Junhan defeated Sharon Alguetti (2619) in hard-fought matches. Results and winners' photos. Action shots from Glen Randmer. Video of the final. 134 players, including 13 rated over 2500. In the open final, Kaden Xu (2649) defeated Jishan Liang (2660) (6,1,10). Results and winners' photos. Video of the final. Saturday action shots from Warren Rosenberg; Sunday shots from Glen Randmer. 115 players. In the open final, Croatia's Andrej Gacina, ITTF-ranked #20 in the world, defeated the WTTC's Kai Zhang (2648) (8,-9,1,-11,5). Results and winners' photos. Semifinal video Andrej Gacina vs. Ye Tian, Jian Li vs. Kai Zhang. Final Andrej Gacina vs. Kai Zhang. Action shots from Glen Randmer, Joel Hoffman/Eldin Medunjanin. 50 players over two days. 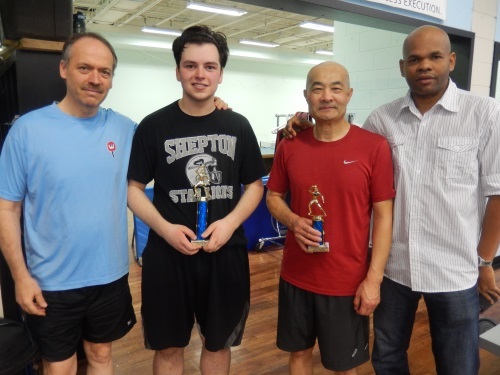 In the final of the giant snake ladder event, Westchester TTC's Robert Roberts (2520) defeated Anthony Valerio (2372) 12-10 in the fifth. Results and winners' photos. Action shots from Glen Randmer, Warren Rosenberg. Writeup and photos in MetroSports Magazine. Women players shown above. 128 players, including 10 rated over 2500. In the open final, chopper/ smasher Jian Li (2661) defeated Nigeria's Olajide Omotayo (2566) (4,-9,6,9). Results and winners' photos. Ben Nisbet's video of the final. Action shots from Glen Randmer, Joel Hoffman/Eldin Medunjanin. 138 players, including ones from 10 foreign countries. In the open final, Ruichao Chen (2689) defeated Yutian Wang (2541) (-8,3,8,2). Results and winners' photos. Action shots from Glen Randmer. Video of the final. 131 players, including Yadira Silva, the #1 female player in Mexico, and Olajide Omotayo, from Nigeria, ITTF-ranked #635 in the world. In the open final, Zi Rui Zhao (2643) defeated Kaden Xu (2659) (9,-6,-11,4,2). Results and winners' photos. Video of the finals. Action shots from Glen Randmer. 149 players, including five rated over 2600. In the open final, Jian Li (2630) defeated Kai Zhang (2629) (9,8,7). ESPN filmed Kai for a "SportsCenter" feature to air in June. Results and winners' photos. Action shots from Joel Hoffman, Henry Lee, Glen Randmer. Video of semifinal Kai Zhang vs. Julian Mohr. Final Jian Li vs. Kai Zhang. 86 players. 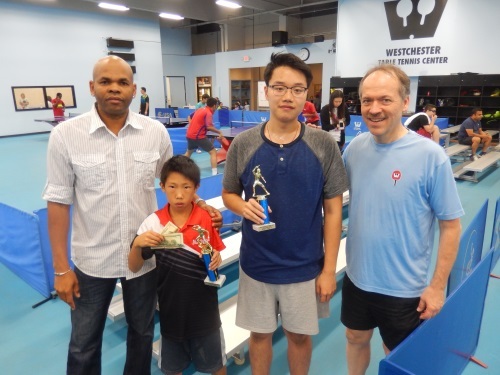 The WTTC's Kai Zhang won both the Men's Open and 18 & Under. Results and winner's photos. Photos from Warren Rosenberg, Joel Hoffman, Glen Randmer. Video of the final. MetroSports magazine about the event. On April 25 the WTTC was the site of filming for a prospective weekly TV series in which people settle disputes and rivalries over a ping-pong table. Photos of the evening from Glen Randmer, Joel Hoffman. 136 players, including 14 rated over 2500. In the open final, Bohan Zhang (2714) outlasted Zi Rui Zhao (2681) (7,-8,9.-9,7). 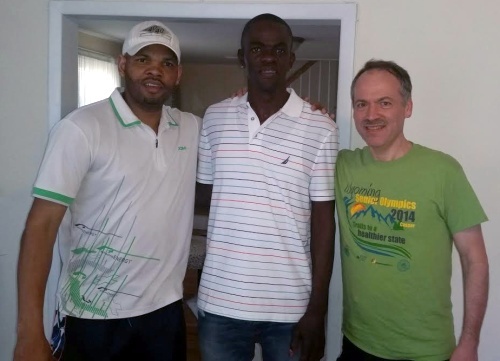 Cédric Oba of Côte d'Ivoire won the U2500. 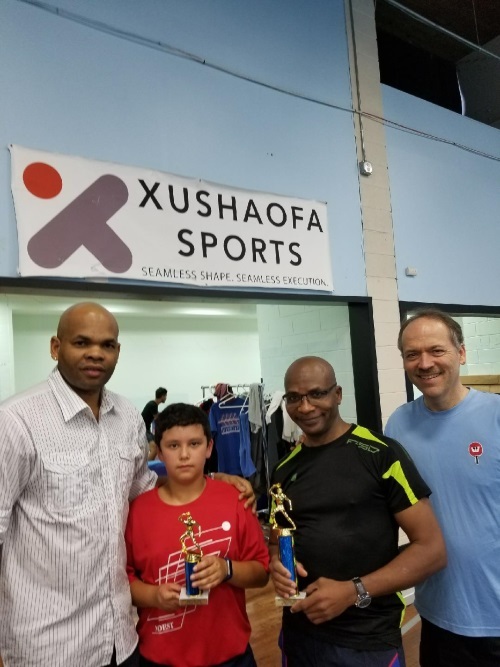 Table Tennis Hall-of-Famer Dell Sweeris won the U2050, U2000, and 60 & Over. Results and winner's photos. Video of the final. Sunday action shots from Glen Randmer, Henry Lee. The club's side room will serve as a polling station for the New York State Republican and Democratic primaries on Tuesday, April 19 -- 6 am to 9 pm. The main room will be open for play all day. 123 players. In the open final, Zi Rui Zhao (2580) beat a jet-lagged and sick Bohan Zhang (2710) (9,6,12), in what was still a fine match. Results and winners' photos. Sunday action shots from Glen Randmer. Video of the finals. 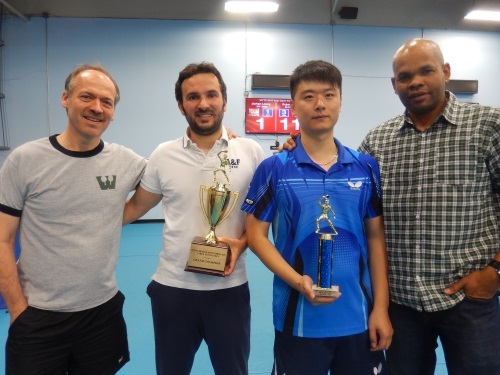 Congratulations to the winners of the NCTTA's Northeast regional championship, held at the WTTC on Feb. 27-28: Coed team — 1st Baruch, 2nd NYU, 3rd Columbia. Women's team — NYU. Men's singles — Mishel Levinski, Baruch. Women's singles — Mandy Liu, NYU. Results. Round-by-round scores (click on Northeast Regional Championships "Results"). Photos and video. MetroSports magazine all about the tournament. 116 players. In the open final, Zi Rui Zhao (2617) beat Jian Li (2637) (6,9,9). Results and winners' photos. Video of the finals. Action shots from Glen Randmer (Sunday), Warren Rosenberg (Saturday). Will Shortz was interviewed about the upcoming NCTTA regional championship taking place at the WTTC on Feb. 27-28. 11 minutes. You can watch it here. Congratulations to the WTTC's Sharon Alguetti, 14, who won a spot on the U.S. Olympic table tennis team at the recent Olympic trials. He is the youngest male ever to make the team. The club celebrated his victory with a party on Feb. 13. Photos from Glen Randmer. 93 players — 12 rated over 2500 — in a rescheduled tournament from the snowed-out previous weekend. In a razor-tight final in the open playoffs, Kaden Xu (2699) beat Zi Rui Zhao (2587) (10,-9,6,-7,11). Results and winners' photos. Action shots from Henry Lee, Glen Randmer. Video of the final by Ben Nisbet. 124 players — 11 rated over 2500. In the open playoffs, Jianho Sun (2545) dispatched Zi Rui Zhao (2668) in a quarterfinal, Kai Zhang (2692) in a semi, and Hao Li (2607) in the final (-14,9,9,5). In the U2500, Rajat Hubli defeated Togo champion Kokou Fanny and U.S. Nationals semifinalist Allen Wang to take first prize. Results and winners' photos. Action shots from Warren Rosenberg, Glen Randmer, Richard Getler. Video of the final. 142 players, in the strongest Westchester field ever — 16 players rated over 2500, including five over 2700. In the final of the open event, Chinese chopper/smasher Wei Wang (2810) defeated Korea's Ojin Kwon (9,3,10). Complete round robin scores, playoffs, and summary compiled by Tej Singh. Winners' photos. Action shots from Henry Lee, Glen Randmer. Semifinal video Ruichao Chen vs. Wei Wang. Final Wang vs. Kwon. 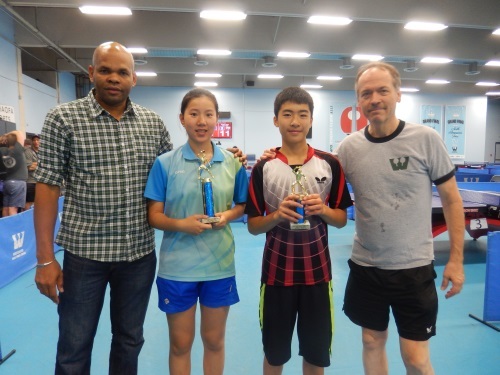 Congratulations to the WTTC's Kai Zhang for winning the Portuguese Junior Table Tennis Open, Nov. 18-19. He is now qualified to compete at the World Junior Circuit Finals in Indore, India, in January. 108 players, with 14 rated over 2500. In the final of the open, Kai Zhang defeated Jishan Liang (8,9,-8,6) to win the $2,500 first prize. The nail-biter of the weekend was Kai's stunning comeback in a quarterfinal over newcomer Hao Li, a player in China's elite Second League (11,-6,-11,13,8). Results and winners' photos. Henry Lee's action shots. Video of the final. Article, partly about the tournament, in The New Yorker. A record 164 players — 14 rated over 2500. 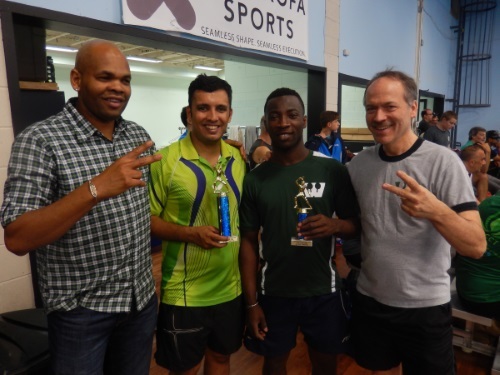 New players included Ange-Cédric Oba, table tennis champion of Côte d'Ivoire; Neha Aggarwal, 2012 table tennis Olympian from India; and Timothy Wang, 2015 North American Champion. In the final of the open event, Kai Zhang (rated 2707) defeated Zi Rui Zhao (2590) (-9,9,8,8). Results and winners' photos. Photos from Henry Lee, Glen Randmer. Video of the finals with Ben Nisbet. 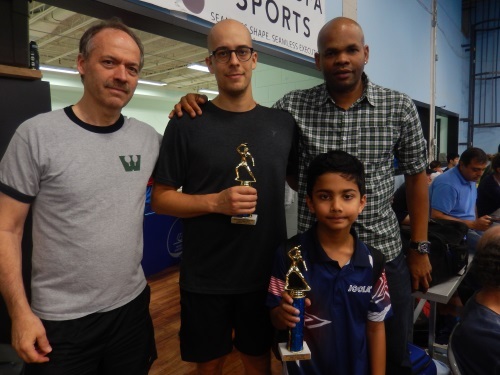 The NA Championships were held at the WTTC on Sept. 5-7 -- men's and women's singles and teams, and the same for boys and girls. The U.S. took gold in every event. In the women's singles' final, the U.S.'s Lily Zhang came back from a 0-3 game deficit against Canada's Mo Zhang to win 4-3. Congratulations to men's singles champion Timothy Wang, who defeated Canada's Pierre-Luc Theriault 4-1 in the final. Results and videos. Highlights. Photos from Warren Rosenberg (click "Sports Events," then event name), Joel Hoffman, Glen Randmer, Henry Lee. 155 players — 10 rated over 2500. The final of the open event was a rematch of July's final between Kai Zhang (rated 2682) and Ruichao Chen (2676) This time Ruichao won (4,11,-7,9). Results and winners' photos. Video of the finals. 159 players, the second-biggest WTTC tournament ever. Players came from Bosnia, Dominican Republic, Barbados, Trinidad & Tobago, Canada, and across the U.S. In the final of the open event, Kai Zhang (rated 2661) defeated Ruichao Chen (2664) (4,4,6). Results and winners' photos. Action shots from Henry Lee / Glen Randmer. Video of the finals with Ben Nisbet. 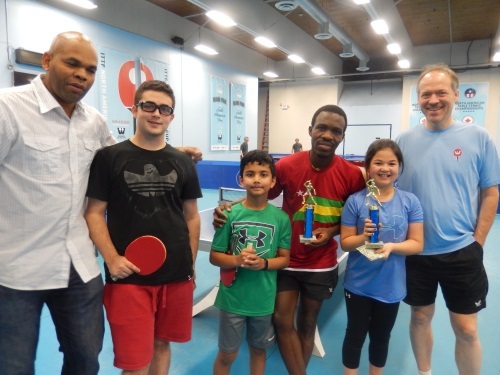 Thirty-three kids, including 12 from Trinidad & Tobago, participated in Week 2 of the WTTC's summer camp, with coaches Rawle Alleyne, Paul David, Kai Zhang, and Hanwei Wang. 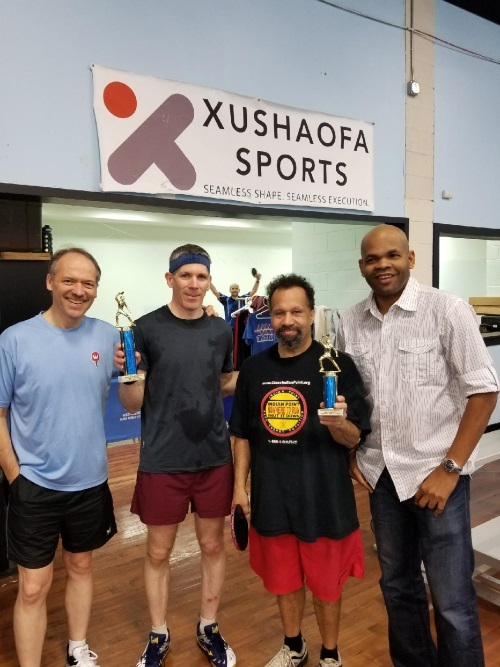 Will Shortz celebrated playing table tennis for his 1,000th consecutive day on June 30. The filmmakers Henry Joost and Ariel Schulman ("Catfish," "Paranormal Activity 3" and "4") presented a video on Will. Journal News article + video on the party. Vulture article + interview. MetroSports Magazine article (pp. 22-26). Photos from Warren Rosenberg / Glen Randmer / Joel Hoffman / Laurel Gollo. 134 players, including 12 rated over 2500. In the final of the open event, the WTTC's Kai Zhang (rated 2689) defeated Poland's Filip Szymanski (2700) (-11,9,4,10). Besides Poland, players came from Idaho, Texas, Georgia, Mississippi, and all over the Northeast. Results and winners' photos. Action photos from Joel Hoffman ... and Glen Randmer. Video of the finals by Ben Nisbet. 142 players, including 12 rated over 2500. In the final of the open event, chopper/smasher Qing Feng Guang (rated 2689) defeated Jishan Liang (2665) (8,-10,8,6). Newcomer Rajat Hubli from France won the U-2500. Results and winners' photos. Action shots from Henry Lee, Joel Hoffman. Video of the finals from Ben Nisbet. ... for winning the 2015 Canadian Junior Open on May 13-14! He went undefeated, including beating Kanak Jha, the defending champion from California. Thank you to Westchester TTC members for donating $6,395 to help Trevor Salmon (above center) after his stroke. Robert and Will delivered a check on May 10. 139 players, including nine rated over 2500, four rated over 2700. In the final of the open event, 2014 NA Cup champion Eugene Wang (rated 2816) defeated Jishan Liang (2645) (5,4,3). Results and winners' photos. Action shots from Glen Randmer, Henry Lee. Video of the finals from Ben Nisbet. 132 players. In the final of the open, Kai Zhang (rated 2706) defeated Bochao Li (2666) (6,10,4). In a semifinal, Kai defeated his longtime rival Jishan Liang, after being down 2 games to 1. Results and winners' photos. Action shots from Glen Randmer, Henry Lee. Video of the final. 125 players, including four rated over 2600. In the final of the open, Jishan Liang (rated 2646) was defeated by his friend and nemesis Kai Zhang (2664) (10,9,-8,10). In the U2500 final, Nigeria's Yinka Olasoji defeated Kun Yang (2479) (7,9,-8,8). Results and winners' photos. Action shots from Glen Randmer, Henry Lee. Video of the final. In short ... wow! In the final, Canada's Eugene Wang (rated 2799) defeated California's Bob Chen (2730) in a sensational seven-game match (8,-5,7,-9,9,-4,3). Tournament wrap-up. Videos. Slide shows by Warren Rosenberg, Glen Randmer, Serge Migdal. Wang/Chen slow-mo point. Journal News article. Pre-tournament press release. 113 players. In a thrilling open final, the WTTC's Kai Zhang (rated 2664) defeated Gaoxiang Zhao (2679) (9,-10,7,-5,11). Results and winners' photos. Fantastic slo-mo point from the final (1:40) courtesy of Bob Mankoff. Full video. Sunday action shots from Glen Randmer. 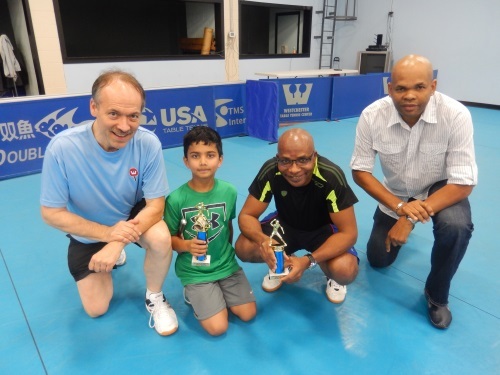 About 25 kids competed in four age categories in the WTTC's Winter 2015 Kids' Tournament. Results and photos. 141 players, including an unusual number of out-of-towners. In the final of the open, Ruichao Chen (rated 2606) defeated former U.S. Nationals champion Michael Landers (2512) (7,9,7). Results and winners' photos. Video of the finals. Action shots from Warren Rosenberg (under "Sports Events") Henry Lee, and Glen Randmer. New rubberized flooring was installed throughout the main hall on Dec. 22-23. Players will now need to wear proper athletic shoes when playing on the surface. 127 players, with six of the top eight coming from China. Seven players rated 2600+. In the final of the open, Wei Wang defeated Jie Te Zhang 5, 7, -11, 7. Results and winners' photos. Henry Lee's action shots. Glen Randmer's. Video of the Inclusion event. Video of the semifinal Jie Te Zhang vs Qing Feng Guang. Also Wei Wang vs. Jin Ze Cao. Final Wei Wang vs. Jie Te Zhang. 138 players, including five rated 2600+. In the final of the open, chopper Qing Feng Guang beat Kai Zhang 8, -10, 4, 9. Results and winners' photos. Quarterfinal video (Damien Provost vs. Bochao Li), semifinal (Provost vs. Qing Feng Guang), final (Guang vs. Kai Zhang). Saturday action shots from Warren Rosenberg. Sunday action shots from Henry Lee. Marco Santini demonstrated his cool table tennis variation, Inclusion, at the WTTC on Oct. 4. Video. 129 players, including eight rated 2500+, In the final of the open event, teenaged Zi Rui Zhao, newly arrived from China, defeated Jishan Liang 10, 3, 8. Defending champion Qing Feng Guang lost to Jishan in a thrilling semifinal 10, 3, -10, -10, 8. Results and winners' photos. Action shots from Warren Rosenberg / Henry Lee. Video of the finals / semifinal. 112 players, including the #1 player in the country, Qing Feng Guang (rated 2776). In the finals of the open, Guang beat the WTTC's Kai Zhang (2666) 1, 4, -7, 8. Results and winners' photos. Video of the final. Warren Rosenberg's action shots from Sunday (click "Sports Events"). 142 players. In the finals of the open, China's Qing Feng Guang (rated 2770) defeated four-time WTTC champion Damien Provost (2622) 9, 12, 9. Results and winners' photos. Video of the final. Another video, with different angles and slow-motion replays. Warren Rosenberg's action shots from Saturday (click "Sports Events"). 115 players in the tournament's most competitive field ever -- 12 rated over 2500, seven over 2600. Players came from seven foreign countries and coast to coast in the U.S. to compete. In the final of the open, Slovenia's Bojan Tokic (ranked #46 in the world) beat Chinese chopper Qing Feng Guang -9, 5, 2, 6. Results and winners' photos. Warren Rosenberg's action shots (click "Sports Events"). Video of the finals. 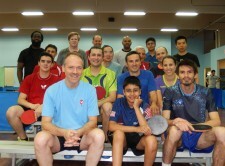 Sixteen players from California to New York took training from Bojan Tokic (ITTF-ranked #46 in the world) on June 27. Members of the second training session are pictured above. Bojan is in the blue shirt in the second row. 123 players. In the final of the open, the WTTC's Kai Zhang (2699) beat longtime rival Jishan Liang (2581) 3, -10, 5, 7. Results and Photos. Video of the finals. 149 players (six 2550+) -- our second-biggest tournament ever. In the final of the open, China's Bob Chen (2735) beat Kai Zhang (2704) 4, 8, -8, 4. They won $2,500 and $1,000, respectively. Results and Photos. Video of the finals. Former #2 female player from India, Moonmoon Mukherjee -- now a coach for the Indian Railway team -- played at the club on April 19. She hopes to send young Indian players here for training. 22 players. 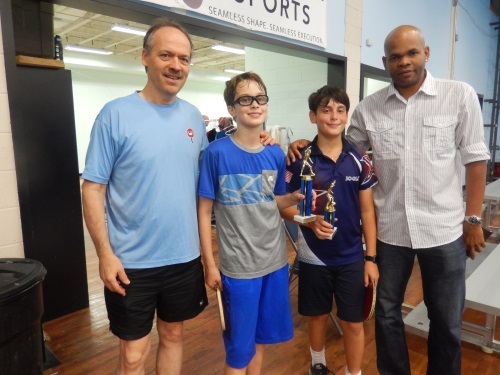 Congratulations to Johannes Kantorczyk (10 & Under), Henry Nicklin (11 & 12) and Noah Landgarten (13 & 14). More results, winners' photos. … is here. The WTTC scene starts at about 11:45. 122 players. In the final of the open event, the WTTC's Kai Zhang (2685) upset China's Bob Chen (2740) 5, 9, -9, -8, 6. Bob had beaten Kai in straight games only the week before at F.I.T. Results and photos. Video of the finals. 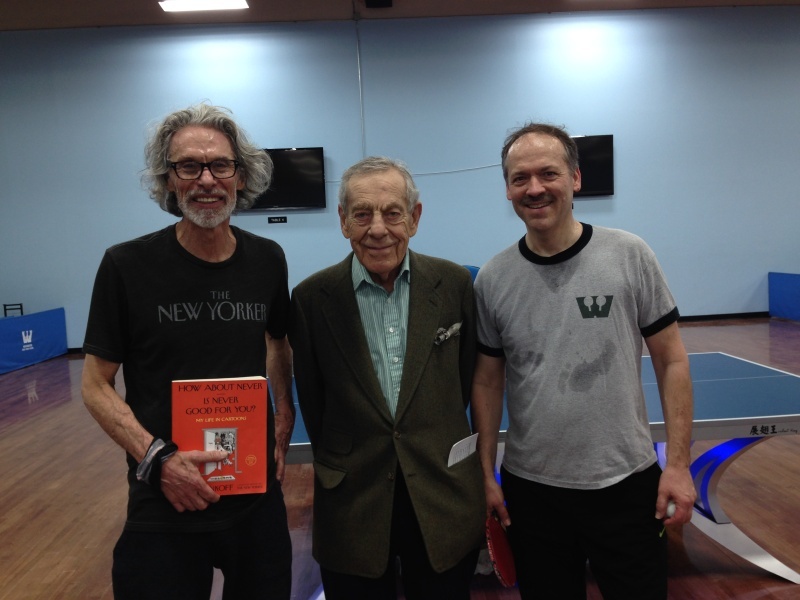 Morley Safer and a film crew from "60 Minutes" were at the club on Feb. 19 to film Bob Mankoff and Will Shortz playing TT. 118 players. The WTTC's own Kai Zhang (2670, ranked #5 in the country) defeated XinXu Zhao (2535) -13, 5, 7, 9 -- for his 8th win at a WTTC Open. Results and photos. Video. Congratulations to the winners of the WTTC's Winter Kids' Tournament: 10 & Under -- Shaye Kirman, 11-12 -- Abe Gold; 13-14 -- Amel Medunjanin. Winners' photos. An average of 25-30 players a day, representing all ages and skill levels, took part in the WTTC's four-day Holiday Clinic, Dec. 27-30. Robert and Rawle did drills and led games. The Dec. 28 group appears above. 55 players -- a low turnout due to a snowstorm and the holidays. 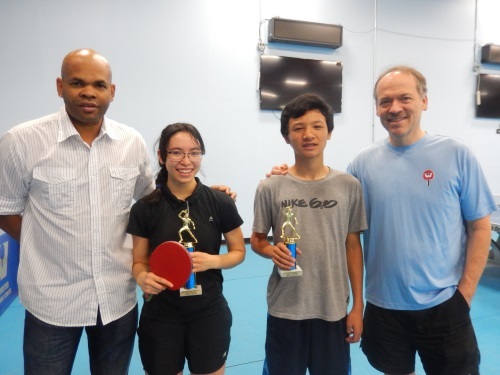 In the finals of the open, the WTTC's Kai Zhang (ranked 10th in the country) upset Damien Provost (ranked 6th) and Kewei Li (ranked 2nd) to take home the $1,500 grand prize. Warren Rosenberg's action shots. Results and winners' photos. 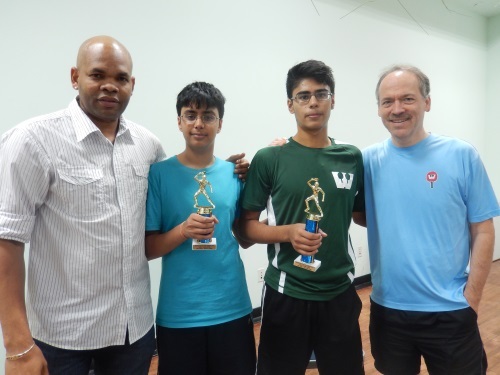 Congratulations to the winners of the Pleasantville HS table tennis tournament, held at the WTTC on Dec. 6: 1. Adam Bucheister 2. Josh Wallen 3. Paul French. Also to the winners of Horace Greeley HS: 1. Robbie Laidlaw 2. Richard Ma 3. Robert Sterian. 109 players, including 10 rated over 2500. In the final of the open event, Atlanta's Kewei Li (rated 2686) won for the second month in a row, defeating Wen Guo of China (3,15,12). Photos and Results. Video will be posted shortly. 143 players -- the highest number since Oct. 2011. Five of the country's top 11 players competed. In the final of the open event, chopper Kewei Li (rated 2662) defeated Kai Zhang (2661) (3,9,6). Results + winners' photos. Warren Rosenberg's action shots. Video of the finals. Best semifinal. 108 players this month. In the final of the open event, the WTTC's Kai Zhang (rated 2648) won in a mild upset over France's Damien Provost (2670). Photos and results. 109 players. The WTTC's Kai Zhang (rated 2644) defeated his onetime training partner Jing Yi Zhao (2461) in the final of the open event. Results and photos here. 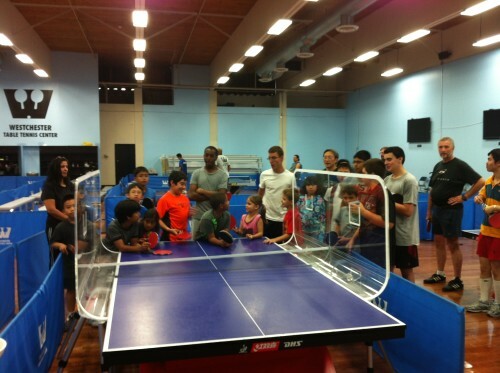 On Aug. 15 Marco Santini demonstrated his new table tennis invention, Inclusion, with side walls added to the table for a new dimension of play. More info here. 103 players. In the final of the open event, China's Bochao Li (2617) defeated Max Wang (2527) (7,8,9). Results and photos. Warren Rosenberg's photos from Sunday. Video of the finals. Quarterly results are here. Note: A new Team League Night will start in September. 118 players. In the final of the open event, Eugene Wang (2810) defeated the WTTC's Kai Zhang (2659) by a hair's-breadth (8,-7,-8,10,3). Video of the final match. Results and photos. 113 players. In the final of the open event, Kai Zhang (2639) defeated Damien Provost (2686) (9,5,7). Best match of the weekend was a ferocious semifinal pitting Kai against Michael Landers (2567). Kai won (-9,8,-8,9,9). Results and photos. The Westchester TTC is prominent in the ITTF's wrap-up of April events. 123 players -- 11 rated 2500+. In the final of the open event, Canada's Eugene Wang (2806) rallied from a two-game deficit to beat France's Damien Provost in a nail-biting deuce-in-the-fifth set (-10,-12,10,5,11). A big contingent from Florida's Broward TTC (above) took part. Results and photos. Canada's Andre Ho upset the U.S.'s Timothy Wang in the men's final of the 2013 ITTF North America Cup, held April 20-21 at the WTTC. Lily Zhang beat fellow American Ariel Hsing in the women's final. Videos of the top matches can be found on the ITTF YouTube channel. Still shots can be found on Warren Rosenberg's site. The Journal News has an article and a slide show. Also: Newsday slide show. Newsday video. ITTF stories. Bruce Liu photos. Quarterly results are here. Congratulations to Victor Krupinski and all the winners! 115 players. In the final of the open event, France's Damien Provost (2667) upset Taiwan's Chia-sheng Lee (ITTF-ranked #194 in the world) in straight games (9,10,5). Results and photos. 108 players -- seven of them over 2400, four over 2500. In the open event, Kai Zhang (2603) upset Damien Provost (2670) in an exciting five-game final (1,11,-9,-10,6). The Costa Rican national table tennis team captured seven prizes over the weekend. Mexico's Yadira Silva made it to the quarters of the open and the semis of the U-2500. The Handicap event drew a record 29 players. Results and winners' photos are here. Warren Rosenberg's action shots are here; digital downloads and prints may be ordered from him. 111 players, five rated over 2500. In the open event Kai Zhang (2583) defeated YanJun Gao (2574) in a furious final (13,10,14). Results and photos. Twenty-three players competed in our Beer Pong tournament on Jan. 19. Results and photos are here. Newsday pre-story and photo here and slide show of the event here. Journal News photos of the event (not looking our best!) here. 14 competed. Results and photos. France's Damien Provost defeated Brooklyn's Mishel Levinski (6,6,-10,4) in the final of our December Open. Results and photos. Warren Rosenberg's action shots are here; digital downloads and prints may be ordered from him. 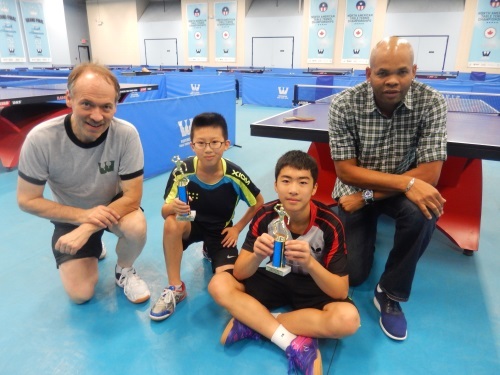 15-year-old Kai Zhang defeated Max Wang in the final of our November Open, which was part of New York Table Tennis Weekend. Results and photos. Eugene Wang (USATT-rated 2783) of the Canadian national table tennis team defeated 15-year-old Chinese phenom Kai Zhang (2557) in straight games to win $2,500 in the finals of the WTTC's October Open. Results and photos. 7, -9, 6, 10. Altogether 123 players competed, including six rated over 2500. Results and photos here. France's Damien Provost (USATT-rated 2695) defeated chopper Qing Liang Wang (2641) 10, 7, 6 in the final of our August Open. Altogether 136 players competed. Results and photos. Freelance photographer Warren Rosenberg's action shots appear here. Eleven students are taking Sydney Christophe's coaching clinic at the WTTC (Aug. 4, 5, 11, 12, and 25). At the end they'll receive ITTF Level 1 coaching certification. In the photo, Sydney is in the middle row, second from the left. Kevin Wang (USATT-rated 2476) dispatched Max Wang (2556) 3-0 in the finals of the WTTC's July Open. It was the semifinal matches -- Kevin beating YanJun Gao and Max beating Peng Yin -- that were nail-biters. Each went to five games. Altogether 123 players competed. Photos and Results. For the first time at one of our Opens, YanJun Gao wasn't the champion or runner-up. France's Damien Provost (2651) beat Peng Yin (2544) in a hard-fought, four-game match. Photos and results. Congratulations to the winners of the club's first Seniors' Tournament on May 12. Photos and results. 36 teams competed in five events for $2,500 in prizes in our first Doubles tournament on May 5. Photos and results.